Analyzing the spread of the "Starbucks" model (10,800 coffee shops in 34 countries with 25 million clients per week in 2006) in the sociocultural context of contemporary China is an opportunity to reconsider mobility, which is to say the way in which the movements of individuals interact with their activities and with space. Traditionally, mobility is limited to movement: the relation between individuals and space depends on transport alone. With mobile communication tools, individuals can situate their actions on different geographical scales in a quasi-instantaneous manner and combine local and non-local relationships in all forms of social interaction. Thus the mobility linked to ICTs (Information and Communication Technologies) makes possible a continuity in the occupation of time and renews space/time links. Space becomes less discontinuous and the distinctions between mobility and immobility, between proximity and distance, are reduced. Starbucks' senior management have chosen to occupy urban space in order to make available to individuals places where professional and/or private interaction will not be interrupted and can even be simultaneous. In 2002 the company innovated by offering Wi-Fi access and developing the concept of a third place, between the office and home. Our study, centred on the utilisation in Beijing of these new territories of mobility, semi-public semi-private spaces, show social practices that reveal need for access to distant services but also for nearby social interaction. Their technical equipment makes possible a partial escape from the constraints of time and space (Mei Po Kwan, 2002). However this is not in any way to announce the end of geography: on the one hand, the choice of their location is closely dependent on urban geography, and on the other they polarise within a new spacial form a supply of services linked to mobility and certain urban social practices. Our remarks are arranged in four sections: a presentation of the methodology used; an overview of the Starbucks model and of its development in China and in Beijing; the geographical context and its local determinants; and the results of our research. This analysis is essentially based on existing research in the fields of urban geography and ITCs, but it also draws on economics, sociology and other disciplines. A number of reports produced by various consultancies, and articles in the press—most of which are available on the Internet—were used. The company's websites as well as pro- and anti-Starbucks sites also offer interesting information about its economic model and the development strategy of its network. These numerous materials, mostly published in English, remain difficult to assess, however. Lastly an approach to the territorial context in all its cultural, economic and social dimensions, proved essential in order to analyse its interactions with the spread and the appropriation of the Starbucks phenomenon. This study, carried out in April 2006 on a limited sample of 30 people between 20 and 60 years old, has an exploratory scope. The methodological approach combines a face-to-face questionnaire with an in-depth interview of users. The corpus was treated statistically and analysed from the perspective of other research (Hwang, 2005). Among the fifty Starbucks listed in Beijing, we eliminated the corners (and similar places) as well as those which seemed unrepresentative (such as those at the airport and at Tiananmen), and then selected two establishments characteristic of the network. The store in the Grand Pacific (the Nokia building) is located on the ground floor of a luxury department store in the embassy quarter, at the intersection of flows that link it to the towers close to the CBD (Central Business District). It is mostly frequented by businessmen, both expatriate and Chinese, and by the very trendy milieu of fashion and the cinema. Less centrally located, the Lido (a shopping mall close to the Holiday Inn) receives more Chinese and tourists, as well as expatriates who work in the west of the capital (which includes Ikea and the Olympic Centre, see Figure 2). Given the lack of objective data on their users, we resorted to pure observation in order to construct a sample that combines characteristics such as gender, geographical origins and social profiles. The hypothesis is that appropriation practices vary according to social and cultural profiles. The cultural diversity of the team was essential for the questionnaires and the interviews. The concept of mobility does not have the same value or meaning to a Chinese as to an American. In fact, the word "mobility" is understood by the Chinese rather in the sense of "floating population" (liudong renkou). This is the word used today to designate the worker-peasants (mingong) who leave the countryside to work in the cities. When one mentions the words "mobile" or "mobility" in the Chinese context, the first image that comes to the mind is often that of a mingong. Mobility therefore has to be explained by describing a way of life with a lot of travel or many missions (liudongxing bijiao da de gongzuo/shenghuo), or by a job or a life with a high degree of mobility (jingchang yao chuchai de gongzuo). Cultural barriers are also found in the understanding of questions about time or about the quality of the coffee. These sometimes reveal differences between Europeans and Americans. These two approaches, the documentary and the qualitative, were enhanced by interviews with people who are very familiar with the metropolis of Beijing. Starbucks was founded in Seattle in 1971, and acquired by H. Schultz in 1987, who changed its name, and created its logo and the economic and social model of "the third place". "We are not in the café business, serving people. We are in the people business, serving coffee". Starbucks is more than "just a wonderful cup of coffee", it's "an extension of daily life", a " 'third place' between home and work, an extension of home or of the office". The formula reveals a strategy which breaks away from traditional cafés as well as from the third market : it is not a transposition of the fast food model to the public consumption of coffee (Dépierre, 2004). The vision of "McCoffee" (Klein, 2000) is overly simplistic. Although the phenomenon is part of a certain standardisation of the world, it is something other than a producer of unaesthetic "junk space" , an urban product of modernisation. The model of the European-style café was adapted to suit mobility in contexts where it did not exist . It can be envisaged as an open public space, in the sense that it is not only a place for social activity, but also because it contributes to "producing the city". The choice of location is strategic; placed in the middle of the flows connected with mobility, it offers a pause in the course of moving around. It has to be easily accessible, convenient, highly visible and ubiquitous. "The Starbucks strategy is based on the principle of having establishments in clusters close to each other. Saturating the market increases consumption and creates virtual billboards from one wall to another […]. It also expels competitors from the street" . The strategy of clustering, of saturating the available space and eliminating the competition can also be explained by the new practices connected with mobility and nomadism , which incite consumers to save time. What Schultz calls this "third space" in the American way of life offers a range of services which differentiate it from other cybercafés as well as from its imitators. It offers a wide range of coffees and associated products: one can eat and drink almost anything, except alcoholic beverages; it is a non-smoking space; the comfortable seating ranges from chairs to sofas; takeaway sales and self-service are the rule; one can sit down and chat for hours without buying anything; the carefully prepared atmosphere seeks to be a reflection of the American model, with soft jazzy music; the seats are equipped with electric outlets and Wi-Fi access is possible for a fee. Everything is an invitation to a stop in a visible café which is accessible and open to the world, "always on", functional, where all social interactions are possible and can be carried on simultaneously; work, meeting, leisure, even just having a cup of coffee. Up to 1986, coffee accounted for 86% of turnover: expresso had become its main activity and most of its turnover was before 11 am. Since 1996, however, when the Frappucino was launched, coffee has only accounted for 15% of turnover. It is no surprise that the chain has invested in Wi-Fi: on the one hand the expansion strategies of Wi-Fi service providers are identical, and on the other, the technology corresponds to the profile of the professional clientele, "trendy" and nomadic. Accordingly, T-Mobile has built one of the world's biggest hot spot networks for Starbucks. As S. Glaziou (2002) states, "The alliance between the major high-tech brands and the café has […] a marketing objective for the various players who position themselves on the mobility chain. It aims to provide a framework of reference for the professional nomad". Thus Starbucks is a customary social setting in the city since it provides spacial capital (see note 1). International expansion began with Asia in 1996 (in Tokyo): the company positioned itself as the first arrival on a market "to be educated" in order to make the brand the standard for "good coffee". The construction strategy for the Chinese network followed the proven methods in the United States: selection of a hub in a great metropolis followed by cluster development. These are beginning to become visible in Shanghai, Hong Kong and Beijing. By May 1st 2006, there were 206 Starbucks in China, with 50 in Beijing and 66 in Shanghai. In association with a local partner, the company has divided China into four markets: Taiwan (1998), Shanghai (2000), Beijing (2000 ), and southern China. The network shows the predominance of coastal China and the preference for a metropolis with large expatriate communities ; however the company’s recent expansion has followed the dynamism of the country and the new development "frontiers", the northeast and the centre. The rate of openings is high, with a new café every week. The implantation strategy aims to attract clients with high purchasing power by locating the shops in the "trendiest" and busiest localities, where the most expatriates circulate. The automated databases used in the United States are not much help in Chinese cities, which are in a state of constant transformation. "In the United States, if you see a shopping mall, it will probably still be there in two years time. After a year goes by in a Chinese city, you will hardly be able to recognise the place ". So the hot spot prospectors, in their search for the ideal locations, follow the trails between the places where potential clients live, work and spend their leisure time. A cult has developed around the brand: fans list and localise Starbucks outlets on interactive maps, and set up blogs about them. Thus Wang Jianshuo, from Shanghai, explores Beijing by travelling from one Starbucks to another, in order to be sure not to miss out on anything in the city.
" Along my route I visited Jianguo Gate, the Parkson Store, Financial Street, the HQs of the biggest Chinese banks, and then I visited the western commercial > district of Xidan [...] The reason I wanted to visit all the Starbucks was that I wanted to see the city. Starbucks helped me to choose the best spots in the city. [...] Just look at a map, and you'll see it's true ." This quotation shows the relationship between the brand and geography and urban practices. Many internet sites, such as hotels and public places, refer to a Starbucks café to show their geographical position. If Starbucks cafés avoid the fate of the malls and are not listed as "non-places" by American radical geography , it is no doubt because of their urban functions: as landmarks for journeys and as havens for individuals in search of a pause or a meeting-place. All the more so as in Beijing there are few public meeting-places; the Starbucks cafés partially fulfill this function. The rise of Starbucks coincides with the development of coffee-drinking, of access to the Internet, and now to Wi-Fi, in the context of tight control of the web by the government (Mengin, 2004). Its strategy has had to come to terms with the territorial context. China, which is known for its thousand-year-old tea culture, is witnessing the gradual growth over several decades of a new habit, that of coffee-drinking. Coffee consumption is still on a small scale, restricted to the urban coastal regions, and concerns only 0.1% to 0.5% of Chinese, according to Euromonitor. However its introduction is an inevitable trend. Between 1998 and 2003, coffee sales increased by 90%, reaching 6,504 tons, while domestic production has almost quadrupled. Nestlé was the first multinational to introduce coffee into China, with the marketing of Nescafé instant coffee in the 1980s, and has invested in coffee-growing mainly in Yunnan, a province traditionally known for its production. Nescafé can now be found in most supermarkets. Nestlé presently controls 85% to 90% of the instant coffee market. However it was Starbucks which in 1999 introduced the consumption of "real coffee". Since then there has been a huge increase in the number of chain's outlets and of their local clones, a multitude of small cafés which have appeared in the largest urban centres based on the Starbucks model. Such a distribution cannot be explained by the coffee itself, but rather by the lifestyle and the social and cultural symbolism that it represents. In China, coffee is associated with the West. The new coffee-drinkers are part of a population which is exposed to Western influences (young urban dwellers, white collar workers, and expatriates as well as Chinese who have returned from abroad). As coffee is the symbol of a new lifestyle, the new coffee-drinkers are very susceptible to major brands. Davidoff, although a brand not reputed for its coffees, launched itself on the market in partnership with Mandarin Fine Food by means of a selection of highly refined coffees, consumed or distributed in well-known restaurants, private clubs and gourmet supermarkets. Sales of its coffee depend on the symbol of its brand, associated with luxury and good taste. Foreigners who only a few years ago were still complaining that they could not get a decent cup of coffee in China now have the choice: Latte and Cappuccino are now the two most popular kinds of coffee while espresso is still considered to have too strong a taste. But you have to pay the price: a cup of coffee at Starbucks costs around 25 yuan . Its premium price is justified by the sale not just of a coffee, but also of a concept. While predictions about coffee consumption are very optimistic, some analysts are more cautious. Tea culture is deeply rooted in people's habits. Many drink tea at home and coffee in public ("it's an attitude"). Since coffee is expensive, it is likely that its consumption will grow slowly. The spacial distribution of Starbucks accompanies and interacts with a multitude of aspects of modernity such as Wi-Fi technology, the new mobility and the American Way of Life. The Starbucks cafés occupy a unique place among the thousands of cybercafés in Beijing. There are three reasons for the large number of cybercafés: on the one hand, while the rate of computer ownership is one of the highest in the world, the rate of home access to the Internet remains low; on the other, leading computer games such as those made by Microsoft and Sony are not sold on the Chinese market because of fears of piracy; and finally, a new "business ecosystem" (Moore 1993) which links the multinationals, the authorities and private local enterprises appeared in 2003. "The establishment of strict industrial regulation and new controls brought respectability, profits and government control to the once extensive and wild otherworld of the cybercafé industry in China ." Oscillating between periods of uncontrolled proliferation and shutdown campaigns on the part of the authorities, the exact number of cybercafés remains unknown, but their profile has changed. "Today, all over China, the Internet is leaving the hidden backstreets of its past for the malls and department stores in the clean attractive neighbourhoods ." They offer non-smoking sections, usually don't serve alcohol, and are concentrated in the area of Haidian in the north of Beijing, where two of China's most prestigious universities are located, the University of Beijing and the University of Tsinghua. This neighbourhood has a very large student population and has the reputation of having become the new heart of the ICT market in Beijing. For all that, the clandestine venues have not disappeared, but have moved into the interstices of the metropolis. " Some unlicensed cybercafés, especially in certain suburbs, neighbourhoods or areas between the city and the country still have not been suppressed. However, some local governments do not impose severe sanctions on these cafés, which allow minors to enter . "In such places, university and high school students naturally surf the Net, but above all it is the internet games networks that bring them together for only a few yuan per hour. A promising market for computer producers , the cybercafés remain politically controversial. While Internet access inside university campuses can still be controlled by the government (it is impossible to access certain sites), controlling the thousands of little cybercafés which proliferate in Beijing is much more difficult. Worried about the dependence of the young, the Ministry of Culture, in December 2005, launched a plan aimed at "promoting a healthy development of the cybercafé industry " and imposing a standard of computer specially designed for cybercafés, which is to say controllable by the authorities. Price remains a discriminatory factor: most people spend less than 20 yuan per month for their connection. The quality of the service provided (speed and free access to websites) varies according to price. Wi-Fi access is mainly restricted to cybercafés located in the desirable parts of the capital and remains expensive. The Starbucks outlets comprise over half of the cybercafés in Beijing which offer a Wi-Fi connection. Only about twenty establishments, mostly located near the embassy quarter (Sanlitun, Chaoyang, etc. ), offered free hotspots in 2006 . As an urban retreat, a Starbucks café serves as a rendezvous for friendly or professional meetings. "It's our coffee machine, with the advantages, but no drawbacks" as one member of an embassy puts it. Here one makes the best use of time; even if one comes alone without any particular objective", "you are certain to run into someone you know". Everyone speaks highly of the location (most work nearby), the amenities that forge the brand image (the range of coffees and the cleanliness which is on a par with modern standards, a much appreciated rarity in public places in Beijing today) and the certainty of running into someone you know. Differences appear between expatriates and Chinese. Expatriates, who respond more readily to the location and the range of coffees available, appreciate the self-service, which allows them to save time as well as to avoid pressing invitations to consume. "Here we're left alone, there's no pressure, it's not like among the Chinese". However they are less responsive to Starbucks prices and culture. All in all, they opt for the most convenient place depending on their urban route, where they know they will be able to activate their work-centred social networks. In contrast the Chinese put the price at the top of their list of reasons for their attraction. The price plays a discriminatory role, selecting the clientele and guaranteeing agreeable company. This is confirmed by the favourite amenities (cleanliness, the range of coffees, the atmosphere, the clientele and the Starbucks culture). The attraction of the complementary products is linked to a cultural difference, which has already been noted in the research on Shanghai (Hwang, 2005). "I come here because it's a good place; there are Starbucks cafés closer to my office and sometimes I go there to work. But I come here with friends and there are lots of people. It's clean. […] I like the atmosphere". They often come from further away and seek above all signs of social distinction and a favourable atmosphere for their networks of professional and especially friendly relations. Evenings and weekends are the times when Beijingers are most numerous among the customers. However the biggest crowds are found in the afternoon, which is a time for encounters between two meetings or just after work ends. The lunch break is still the time for expatriates and white collar workers who are "making the best use of time". Two out of three people visit every business day, one out of three every day of the week. The Chinese stay the longest (often for over an hour) but while expatriates and businessmen usually stay less than an hour, many come several times a day. "Every morning, I start by coming and having a coffee, even though I have of course had one at home; I don't stay long, just long enough to organise my day, then I generally come back after lunch and at that moment I manage to make a professional appointment. On Fridays, I come at the end of the day, to relax and meet my colleagues or some customers". A new public space: office or convivial meeting-place ? All the people in our sample have a computer and an Internet connection at home and at work. The availability of electric outlets near each seat is greatly appreciated. Ignoring the availability of Internet access, a young woman explains that she comes to recharge her digital equipment (her computer and her mobile phone). Half of our sample use a computer and over a quarter use Wi-Fi. The relatively low number is explained by the (unsatisfactory) quality of the service. Connection is expensive (everyone agrees on this), it is slow and the environment is sometimes noisy. "In the United States I had got used to working at Starbucks several afternoons a week. Here it's impossible. "They" make too much noise. I come less often and I just organise my work or send emails here"… "When I have big files to send, I go to SPR (a rival chain) because it's faster and free, but the coffee's bad"; others surf the Net for free at the Grand Pacific Starbucks, using the open and free network of the café next door. The seats next to the adjoining wall of that café are always occupied by people using their computers! While some deplore the high price for connection and the noisy atmosphere of the place, which is not very favourable for working in, there is a definite attraction for the available technology; 43% say they prefer to surf the Net and don't look for social interaction." An apparent paradox is that the interior layout (the comfortable furniture) and the way of functioning (self service with available technology) are designed to save time and/or to stay for hours. Thus it is both a "pause" in their journeys (to 76%) and a place which is "connected with mobility" (to 63%). To managers, the answer seems obvious. "Having a coffee is saving time", because it makes multi-tasking possible. Saving time and multi-tasking seem to be the rule. However interpreting the responses is difficult because of cultural differences, since the sensation of saving or wasting time varies according to social position, and also because of the complexity of situations which makes the responses confusing: "On Sundays I waste time because I come to hang out, read a book or talk to friends; but during the week I save time; I have a quick coffee while setting up my appointments". Others admit to wasting time while noting that "they take advantage of these moments for exchanges with colleagues" over a coffee. Starbucks cafés serve as a window on the world through which to see and to be seen. The Chinese consider the price to be synonymous with quality and modernity, and have no hesitation in being seen in the street holding a bag or a cup with the Starbucks logo on it. This practice, which flies in the face of a local culture which frowns on eating or drinking in the street, surprised all the experts brought in by the brand (Hwang, 2005). People show themselves in Starbucks cafés, above all to their friends, but also to their professional contacts, seeking to catch the mirror reflection of a claim to modernity. They are places of social mixing where certain social groups meet and mix: company cadres, diplomatic personnel, entrepreneurs, trendy young people, etc. As with the big metropolitan hotels (Sanjuan, 2003), they are both an image and a means of opening up the country socially, and provide "social and spacial permeability". But the prices give this public place the quality of an eligibility-based public space which is relayed by other places in Beijing nightlife, located in Chaoyang (Den, etc. ), where a certain cultural mixing can be seen. However, apart from business meetings, the porosity between milieux remains difficult to assess. Our questions about private meetings gave rise to a lot of reservations and it was often only at the end of the interview that the initial refusal to discuss them yielded to tentative confidences. In fact, many people meet at Starbucks cafés and some, especially expatriate men, admit that they come partly for that reason. These can be discreet or longer-lasting encounters, but also times of shared pleasure in being among "ourselves". There is also the blending of spatial dimensions. Here technology (Wi-Fi, and especially the mobile phone) plays an essential role. Patient observation makes it possible to notice to what extent the people who frequent the place are there without being present. One young man sends text messages to a young woman sitting on the terrace, while calling to make a dinner reservation. Another is using Skype, and another is on the Internet, etc. To conclude this preliminary study, it seems that the Starbucks cafés in Beijing serve the function of urban public places. They polarise the supply of mobility linked to the technical networks (wireless and electric outlets, access to transport networks) and of social mobility, whether imaginary (blended images of modernity—depending on the culture and the imagination of the user) or real (social mixing set apart by the situation of a selective public place). They constitute, on a metropolitan scale, both a linking space with the globalised economy and a new form of space that renews the urban landscape, blending the local and foreign social elites. Their strategic geographical location and their amenities, linked to the new social practices of nomadism have created a different place which has many more functions than just that of cybercafé. The spread of Starbucks cafés has followed all the modern contours of its proven American model, but has adapted to the territorial context, even if they present certain aspects (extraterritoriality and standardisation) that make them like non-places (Augé, 1992). In Beijing, the Starbucks ecosystem seems to be a two-fold answer: to an absence (the public place as meeting place), and to a new demand (a territory for mobility). The third place, as conceptualised by Schultz, is aimed at people in a nomadic situation. It's an ad hoc place to free oneself from spatial constraints and to be everywhere and always on. It serves as a bridge, making continuity possible in urban space, but remains highly dependent on geographic localisation. 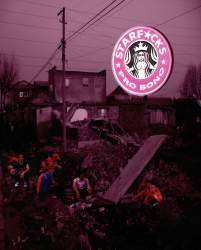 The logic of the selection of Starbucks' locations leads to a geographic concentration in the city which cannot be neutral in the production of urban space and practices. While Starbucks cafés are evidence of the spatial externalisation of the office function (whether SOHO or not), here they serve as urban meeting-places. This dual characteristic produces a new urban configuration, with highly contextualised and coded forms of sociability. Aware of the dangers of perspective distortion linked to the small size of the sample and the number of places observed, the authors wish to enlarge their research both in Beijing and in other Chinese cities. Can the same processes be observed in Hong Kong ? Are we looking at a Chinese particularity in Asia ? Can a more accurate measure be taken of the variations from the American model ? What spatial configurations are produced in other territorial contexts of expansion such as Europe ? Non-Lieux, Introduction à une anthropologie de la surmodernité, Paris, Le Seuil. Les territoires de la mobilité, Paris, PUF. Eléments pour une approche des pratiques culturelles par les réseaux de sociabilité , in O. Donnat, P.Tolila (eds), Le(s) public(s) de la culture, Paris, Presse de > la FNSP, pp. 93-108. La société en réseaux , Paris, Fayard. Le phénomène Starbucks : Café " nomade " pour une société mobile, mémoire de DESS, sous la direction de F. Ascher.
" Pouring It On : The Starbucks Strategy ? Locations, Locations, Locations ", in The Washington Post, 25/08/2002.
" Converting The Masses: Starbucks In China ", in Far Eastern Economics Review, 17/07/2003.
" Information Technology and the Future of Cities ", Journal of Urban Economics, 43, pp. 136-156.
" Café.com : votre autre bureau " http://www.canope.com/downloads/Canope_Cafes_Wi-Fi_2002.pdf, visited on June 4 2006.
" Coffee Goes to China: An Examination of Starbucks’ Market Entry Strategy ", Journal of Undergraduate Research, Volume 6. Mobilités.net. Villes, transports, technologies face aux nouvelles mobilités, Paris, FING-RATP-Bouygues Télécom. Mobilité quotidienne et dynamiques urbaines, Lausanne, Presses polytechniques et universitaires romandes. http://www.freerepublic.com/forum/a369a71e1605d.htm, visited on 4 June 2006.
" Modèle de mobilité, modèle d’urbanité ", Allemand, S, Ascher, F., Lévy, J. (eds. ), Les sens du mouvement, Paris, Belin/ Institut pour la ville en mouvement.
" Capital spatial " in Dictionnaire de la géographie et de l'espace des sociétés, Belin, Paris, pp.124-126. L'espace légitime. Sur la dimension géographique de la fonction politique, Paris, Presses de la fondation nationale des sciences politiques.
" Getting To Know Business Models " http://www.investopedia.com/articles/fundamental/04/033104.asp, visited on 4 June 2006. "Time, Information Technologies and the Geographies of Everyday Life", Urban Geography, 23(5), pp. 471-482. Cyber China, Reshaping National Identities in the Age of Information, Palgrave MacMillan, New York.
" Predators and prey : a new ecology of competition ", in Harvard Business Review , pp.75-86. Des technologies et des territoires, Toulouse Le Mirail. Les Grands Hôtels en Asie. Modernité, dynamiques urbaines et sociabilité, Publications de la Sorbonne, coll. Géographie, Paris. Pour Your Heart into It: How Starbucks Built a Company One Cup at a Time, Hyperion. http://www.fastcompany.com/magazine/84/starbucks_schultz.html, visited on June 1 2006.
" Mobility and proximity", Sociology, 36(2), pp. 255-274.
http://www.vedpuriswar.org/Ved%20Books/The%20Practice%20of%20Innovation-I/starbucks.PDF, visited on 4 June 2006.